A small study followed up an older cohort of patients with isolated left anterior fascicular block on their ECG (isolated left axis deviation), without clinically manifest cardiovascular disease. LAFB was associated with an increased risk of atrial fibrillation, heart failure and death. LAFB is caused by conduction tissue fibrosis, and is a marker of other left heart fibrosis. The patients did not go on to develop left bundle branch block, and only 2 of 39 required pacing in 10 years, suggesting these outcomes were not due to progression of conduction disease. This long term follow up study showed that T-wave inversions in right precordial leads are not associated with adverse outcome. 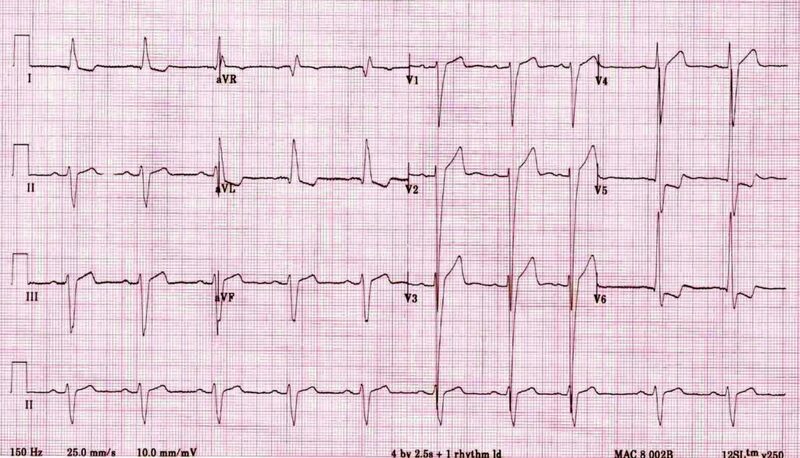 Background-: T-wave inversion in right precordial leads V1 to V3 is a relatively common finding in a 12-lead ECG of children and adolescents and is infrequently found also in healthy adults. 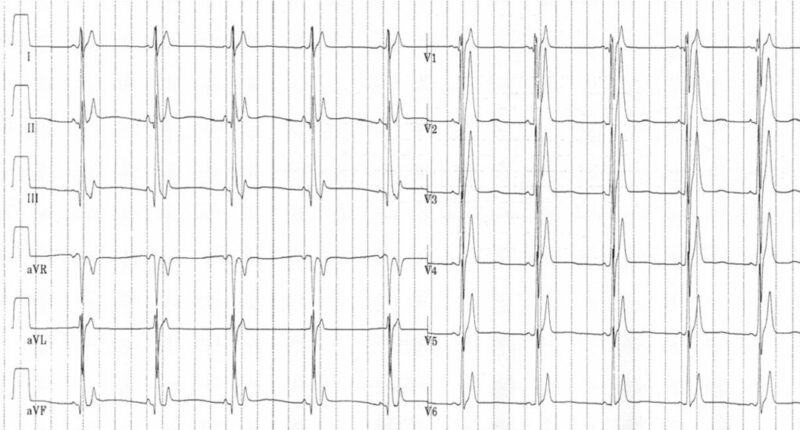 However, this ECG pattern can also be the first presentation of arrhythmogenic right ventricular cardiomyopathy. The prevalence and prognostic significance of T-wave inversions in the middle-aged general population are not well known. 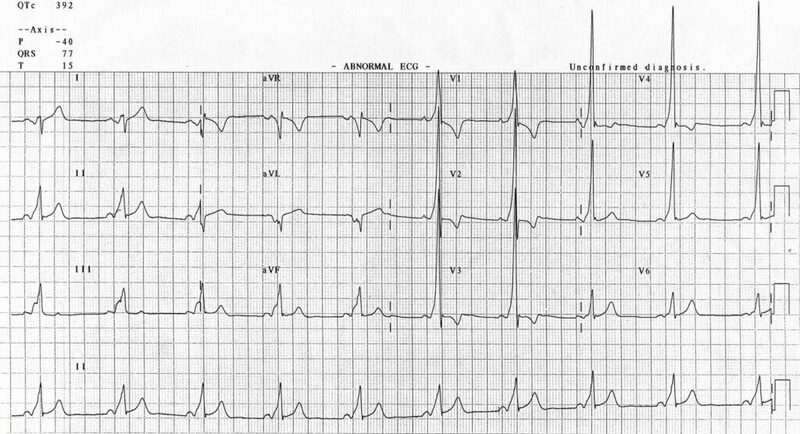 Methods and Results-: We evaluated 12-lead ECGs of 10 899 Finnish middle-aged subjects (52% men, mean age 44+/-8.5 years) recorded between 1966 and 1972 for the presence of inverted T waves and followed the subjects for 30+/-11 years. Primary end points were all-cause mortality, cardiac mortality, and arrhythmic death. T-wave inversions in right precordial leads V1 to V3 were present in 54 (0.5%) of the subjects. In addition, 76 (0.7%) of the subjects had inverted T waves present only in leads other than V1 to V3. Right precordial T-wave inversions did not predict increased mortality (not significant for all end points). However, inverted T waves in leads other than V1 to V3 were associated with an increased risk of cardiac and arrhythmic death (P<0.001 for both). 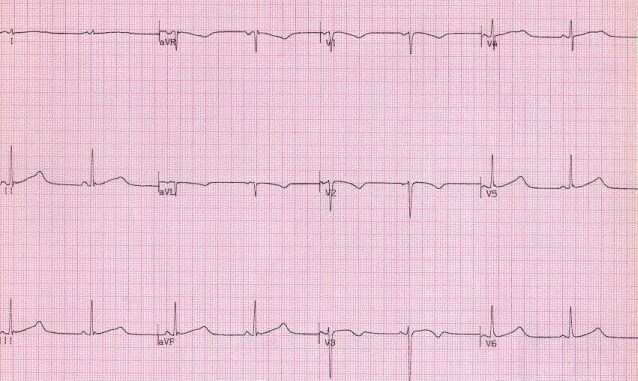 Conclusions-: T-wave inversions in right precordial leads are relatively rare in the general population, and are not associated with adverse outcome. Increased mortality risk associated with inverted T waves in other leads may reflect the presence of an underlying structural heart disease. The threshold values of ST-segment elevation of 0.2 mV (2 mm) in some leads and 0.1 mV (1 mm) in others results from recognition that some elevation of the junction of the QRS complex and the ST segment (the J point) in most chest leads is normal. Recent studies have revealed that the threshold values are dependent on gender, age, and ECG lead (, , ,  and ). In healthy individuals, the amplitude of the ST junction is generally highest in leads V2 and V3 and is greater in men than in women. For men 40 years of age and older, the threshold value for abnormal J-point elevation should be 0.2 mV (2 mm) in leads V2 and V3 and 0.1 mV (1 mm) in all other leads. For men less than 40 years of age, the threshold values for abnormal J-point elevation in leads V2 and V3 should be 0.25 mV (2.5 mm). For women, the threshold value for abnormal J-point elevation should be 0.15 mV (1.5 mm) in leads V2 and V3 and greater than 0.1 mV (1 mm) in all other leads. For men and women, the threshold for abnormal J-point elevation in V3R and V4R should be 0.05 mV (0.5 mm), except for males less than 30 years of age, for whom 0.1 mV (1 mm) is more appropriate. For men and women, the threshold value for abnormal J- point elevation in V7 through V9 should be 0.05 mV (0.5 mm). For men and women of all ages, the threshold value for abnormal J-point depression should be −0.05 mV (−0.5 mm) in leads V2 and V3 and −0.1 mV (−1 mm) in all other leads. J-point elevation 0.15 mV (1.5 mm) in leads V2 and V3 and 0.1 mV (1 mm) in all other leads (women). Shouldn’t be too difficult to remember. Part 10: acute coronary syndromes: 2010 American Heart Association Guidelines for Cardiopulmonary Resuscitation and Emergency Cardiovascular Care. AHA/ACCF/HRS recommendations for the standardization and interpretation of the electrocardiogram: part VI: acute ischemia/infarction: a scientific statement from the American Heart Association Electrocardiography and Arrhythmias Committee, Council on Clinical Cardiology; the American College of Cardiology Foundation; and the Heart Rhythm Society. Endorsed by the International Society for Computerized Electrocardiology. We know that inferior STEMI may be complicated by right ventricular involvement, which is why I whack a V4R lead on all my inferior AMI patients. A recent study using cardiac magnetic resonance imaging showed that RV oedema and regional or global RV dysfunction were common in anterior infarcts too, although the proportion significantly decreased at four month follow up. RV abnormalities are contiguous to the jeopardized LV myocardium and do not occur exclusively in inferior LV infarcts, but are found in up to 33% of anterior LV infarcts as well. The presence of RV ischemic injury is associated with early RV dysfunction as well as with RV functional recovery at follow-up. Right Ventricular Ischemic Injury in Patients With Acute ST-Segment Elevation Myocardial Infarction: Characterization With Cardiovascular Magnetic Resonance. Drowning is one of the leading causes of accidental death in children. Some apparent drownings may be related to sudden cardiac death, in particular to unidentified channelopathies, which are known to precipitate fatal arrhythmias during swimming-related events. The majority of cases of sudden cardiac death in children and adolescents are secondary to either hypertrophic or right ventricular cardiomyopathy with coronary artery abnormalities also prevalent, and reports have demonstrated these cardiac abnormalities on autopsy following sudden swimming-related deaths. However, the majority of autopsies in swimming-related sudden deaths are normal suggesting causation at molecular level, in particular ion channel defects such as type 1 long-QT syndrome (LQT1) and catecholaminergic polymorphic ventricular tachycardia (CPVT). The gene deletion in LQT1 (KCNQ1) leads to a reduction in the repolarising potassium current (IKs) and prolongation of repolarisation. This lengthens the QT interval (which may be lengthened further by facial immersion in cold water). 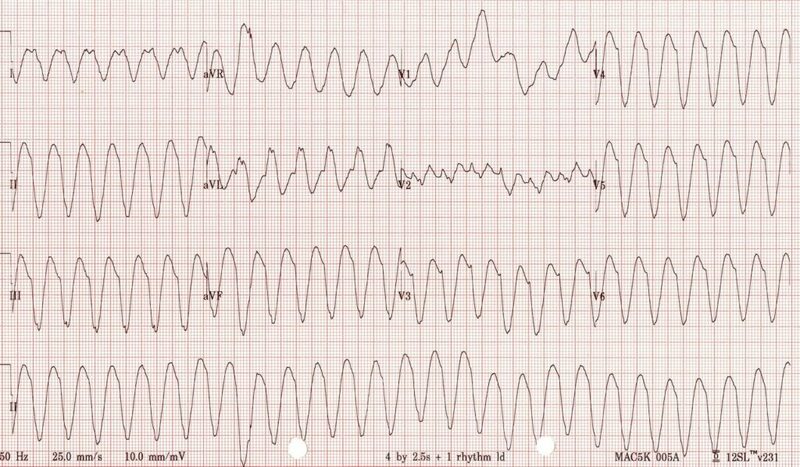 A premature ventricular contraction (PVC) again which may be initiated by swimming occurring during the vulnerable part of repolarisation leads to establishment of polymorphic ventricular tachycardia (torsades de pointes). The ryanodine receptor gene mutation (RyR2) in catecholaminergic polymorphic ventricular tachycardia leads to defective closure of the receptor on the surface of the sarcoplasmic reticulum during diastole. This leads to increased calcium (Ca2+) leakage from the sarcoplasmic reticulum and increased potential for delayed afterdepolarisations and subsequent ventricular tachycardia. Improving awareness in the coronial service of the possibility of a cardiac cause for poorly explained drownings. Education of lifeguards and provision of automated defibrillators in swimming pools. Molecular autopsy for non-survivors to look for potential channelopathies. Screening for survivors and family members of non-survivors to identify those with a channelopathy. Proper counselling for those identified to have a channelopathy on family screening. ECG machines may give a printed report saying ***ACUTE MI***. 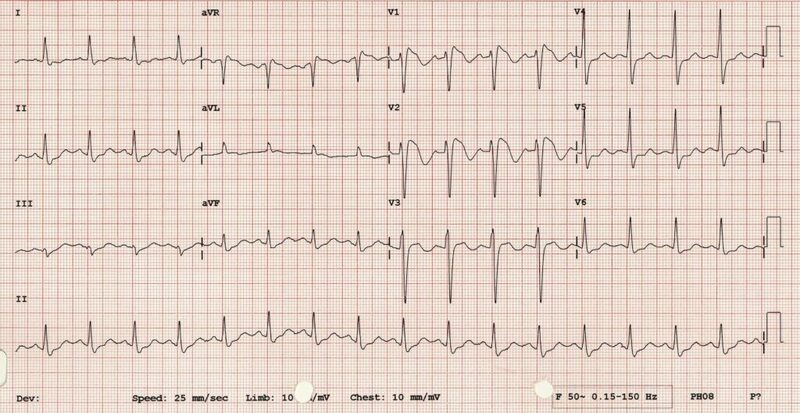 In a retrospective study, patients on the ICU whose 12 lead ECGs contained this electronic interpretation did not have an elevated troponin 85% of the time. Even in the minority of patients whose electronic ECG diagnosis of MI was agreed with by a cardiologist, only one third developed an elevated troponin. Can we tell if AF is new? One of the dilemmas in selecting appropriate therapy for atrial fibrillation in the emergency situation is determining whether the AF is of acute onset or not. AF causes release of natriuretic peptide from the heart, so measuring these peptides may give a clue to the recency of onset if the kinetics are known. This of course can only apply to those patients without heart failure, who have another cause for elevated natriuretic peptide levels. A study of N-terminal pro-BNP levels in patients with acute onset AF, and without clinical or radiological evidence of heart failure, showed the pattern of rise and fall. The key finding in this study is the rapid rise of plasma NT-proBNP levels to peak followed by a rapid decline, probably due to depletion of the granules in atrial myocytes in which pro-BNP is stored. According to our observations, a rising trend is markedly indicative of the fact that AF onset did not happen more than 24–48 h before presentation. As a consequence, obtaining two to three plasma NT-proBNP levels within 24 h of presentation in patients with AF without heart failure who cannot satisfactorily pinpoint the time of onset may assist in determining whether the onset of the arrhythmia was recent. Such information is pertinent to decisions concerning anticoagulation and cardioversion. Short-term fluctuations of plasma NT-proBNP levels in patients with new-onset atrial fibrillation: a way to assess time of onset? Lead V1 directly faces the right ventricle and during an inferior AMI may exhibit ST elevation with concomitant right ventricular infarction. Lead V1 also faces the endocardial surface of the posterolateral left ventricle, and ST depression may reflect concomitant posterolateral infarction (as the “mirror image” of ST elevation involving posterolateral epicardial leads). In this situation, V3 also shows ST depression. In lead V1, however, ST elevation from right ventricular AMI may potentially cancel out the ST depression from posterolateral AMI to give an isoelectric ST level. Diagnosis of right ventricular infarction during an inferior AMI may therefore be aided by evaluating both V1 and V3 ST levels. Both right ventricular infarction and postero-lateral infarction worsen the prognosis of an inferior AMI. In 7967 patients with acute inferior myocardial infarction in the Hirulog and Early Reperfusion or Occlusion-2 (HERO-2) trial, V1 ST levels were analyzed with adjustment for lead V3 ST level for predicting 30-day mortality. V1 ST elevation at baseline, analyzed as a continuous variable, was associated with higher mortality. Unadjusted, each 0.5-mm-step increase in ST level above the isoelectric level was associated with ~25% increase in 30-day mortality; this was true whether V3 ST depression was present or not. The odds ratio for mortality was 1.21 (95% confidence interval, 1.07 to 1.37) after adjustment for inferolateral ST elevation and clinical factors and 1.24 (95% confidence interval, 1.09 to 1.40) if also adjusted for V3 ST level. In contrast, lead V1 ST depression was not associated with mortality after adjustment for V3 ST level. V1 ST elevation ≥1 mm, analyzed dichotomously in all patients, was associated with higher mortality. The odds ratio was 1.28 (95% confidence interval, 1.01 to 1.61) unadjusted, 1.51 (95% confidence interval, 1.19 to 1.92) adjusted for V3 ST level, and 1.35 (95% confidence interval, 1.04 to 1.76) adjusted for ECG and clinical factors. Persistence of V1 ST elevation ≥1 mm 60 minutes after fibrinolysis was associated with higher mortality (10.8% versus 5.5%, P<0.001). The authors conclude that V1 ST elevation identifies patients with acute inferior myocardial infarction who are at higher risk, although because no myocardial imaging was performed, could only speculate that the mechanistic link between V1 elevation and increased mortality is due to the occurrence of right ventricular infarction. This is important to know about in terms of prognostication, but is it useful in the diagnosis of right ventricular AMI? The authors acknowledge that the ECG diagnosis of right ventricular infarction is classically made by recording lead V4R. In an autopsy study of 43 patients, ST elevation in lead V4R had higher sensitivity and specificity than ST elevation in lead V1 in diagnosing right ventricular infarction. Similarly, ST elevation in leads V7 through V9 adds significantly to precordial ST depression in aiding the diagnosis of posterolateral AMI. The authors contend that recording leads V4R and V7 through V9 is an additional step in the performance of a standard 12-lead ECG and, although recommended, may not be routinely performed. I will continue to do a V4R in all inferior AMIs, and a V7-8 at least in patients with ST depression in V1-3.